Peditatus Michiganensis vicensimus unus, una ex centurionibus exercitus Gulielmi Tecumseh Sherman. 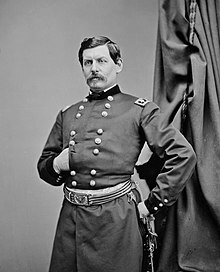 Georgius B. McClellan generalis maior. Imago a Matthaeo Brady facta, 1861. Samuel K. Wilson legionarius (1841–1865) in Sturgis Rifles Peditatus Voluntarii Illinoesiae, 1862. Sepultura mortuorum Unionis in acie Proelii Antietamensis, prope Rivum Antietamensem Terrae Mariae pugnati. Exercitus Unionis fuit vires terrestres quae Unionem per Bellum Civile Americanum ab anno 1861 ad 1865 defenderunt. Constitit ex parvo Exercitu Civitatum Foederatarum, exercitu permanente, permultis unitatibus ex civitates septentrionibus suppeditatis aucto, in militibus voluntariis et conscriptis consistentibus. Exercitus Unionis Exercitus Civitatum Confoederatarum pugnavit et tandem vicit. Circa 360 000 militum Unionis omnibus causis mortui sunt, et 280 000 fere vulnerati sunt. Effectiones militares in Bello Civili in magnas regiones geographicas theatra appellatas proprie digestae sunt. Inter prospectibus effectionum generalium et rationum militarium, vide commentarios de praecipuis belli theatris, inter quos sunt Theatrum Occidentale et Theatrum Orientale. ↑ Vide, exempli gratia, usum in Grant 1885:3. Eicher, John H., et David J. Eicher. 2001. Civil War High Commands. Stanfordiae Californiae: Stanford University Press. ISBN 0804736413. Grant, Ulysses S. 1885–1886. Personal Memoirs of U.S. Grant. 2 vol. Charles L. Webster & Company. ISBN 0914427679. Glatthaar, Joseph T. 1990. Forged in Battle: The Civil War Alliance of Black Soldiers and White Officers. Novi Eboraci: Free Press. ISBN 9780029118153. Hattaway, Herman, et Archer Jones. 1983. How the North Won: A Military History of the Civil War. Urbanae: University of Illinois Press. ISBN 0252009185. McPherson, James M. 1994. What They Fought For, 1861–1865. Baton Rouge: Louisiana State University Press. ISBN 9780807119044. Nevins, Allan. 1959. The Improvised War 1861–1862. The War for the Union, 1. Novi Eboraci: Charles Scribner's Sons. ISBN 0684104261. Nevins, Allan. 1960. War Becomes Revolution 1862–1863. The War for the Union, 2. Novi Eboraci: Charles Scribner's Sons. ISBN 1568522975. Nevins, Allan. 1971. The Organized War 1863–1864. The War for the Union, 3. Novi Eboraci: Charles Scribner's Sons. ISBN 0684104288. Nevins, Allan. 1971. The Organized War to Victory 1864–1865. The War for the Union, 4. Novi Eboraci: Charles Scribner's Sons. ISBN 1568522991. Shannon, Fred A. 1965. The Organization and Administration of the Union Army 1861–1865. 2 vol. Gloucester Massachusettae: P. Smith. Welcher, Frank J. 1989. The Eastern Theater. The Union Army, 1861–1865 Organization and Operations, 1. Bloomington: Indiana University Press, 1989. ISBN 0253364531. Welcher, Frank J. 1993. The Western Theater. The Union Army, 1861–1865 Organization and Operations, 2. Bloomington: Indiana University Press, 1993. ISBN 025336454X. Vicimedia Communia plura habent quae ad Exercitum Unionis spectant.